The official currency code for Indonesian rupiah is IDR. 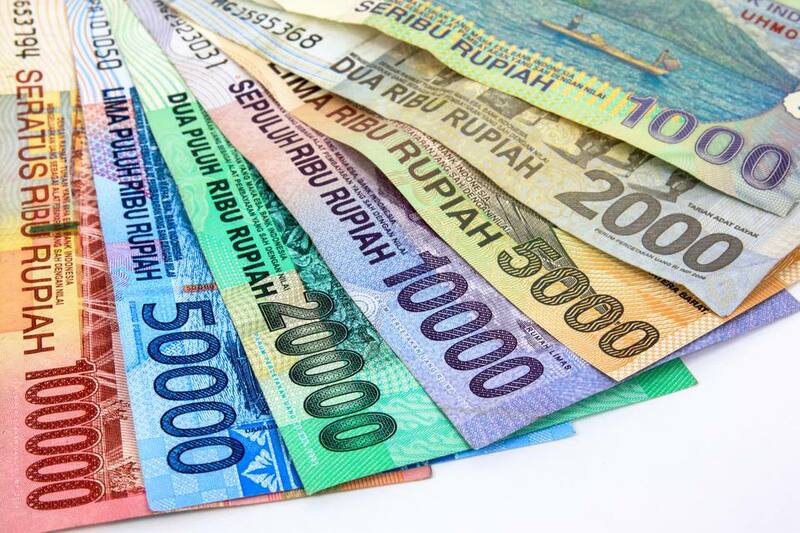 Amounts in rupiah tend to be quite large because of all the zeros. Sometimes prices are given with the "thousand" implied. For example, if someone says that something costs “fifty,” that would mean 50,000 rupiah — around $4. Each Indonesian rupiah is divided into 100 sen, but the value of sen is so low that they are no longer circulated. You’ll most often be dealing with the blue 50,000-rupiah banknotes while traveling in Bali. Some ATMs issue 100,000-rupiah banknotes — the largest denomination. These can sometimes be difficult to break outside of chain eateries and big hotels. Always go for smaller denominations when possible. Indonesian rupiah is colorful, making it easier to differentiate between denominations. 1000s, 2000s, and 5000s are roughly the same blend of colors. The Rp. 5000 banknotes are a little more tan/brown to differentiate them. Rp. 10,000 banknotes are purple. Rp. 20,000 banknotes are green. Rp. 50,000 banknotes are blue (these are very common). Rp. 100,000 banknotes are pink (these are the largest). Coins exist, but travelers don't use them very often. Very unlike in the UK or Europe, coin values are so insignificant that neglecting or losing them is no big deal. The aluminum 500-rupiah coins are so lightweight they almost feel like toy money. Amounts are often rounded to avoid the need for small change; don't feel miffed if you aren't given coins due as part of your change. Some shops and supermarkets will even hand over a few candies to make up the difference in change! Bali is a popular tourist destination; ATMs on the usual Western networks (e.g., Cirrus, Maestro, etc) are easy to find in all the traveler hubs. You are strongly encouraged to spend your money, and access to it is easy! ATMs typically charge a small transaction fee which will be added to whatever fee your bank charges. An international exchange fee may also apply. Fortunately, these fees are nowhere near the exorbitant US $7+ fee charged per transaction in Thailand. Even with the additional fees, using ATMs is usually a better option for getting local currency than paying a commission to exchange money. Use Caution: Card-skimming devices are a real problem in Southeast Asia. These smart devices are installed secretly over the card slot on ATMs to record credentials as cards are slid into the machine. Sometimes membranes are placed over the keyboard to record your PIN. Visually inspect the card slot before inserting your card. Stick to using ATMs in well-lit places where installing such a device would be difficult. If possible, try to use well-lit ATMs attached to bank offices. If your card is captured, you stand a better chance of getting it back. Also, the chances of a card-reading device being installed are less. Some ATM rooms have dedicated security guards present. ATMs in Bali are often labeled with the smallest-denomination currency they will dispense. When possible, opt for machines that issue 50,000-rupiah notes over the ones that issue 100,000-rupiah notes. Breaking the large 100,000-rupiah notes is more of a nuisance outside of hotels and busy bars (e.g., taxi drivers usually won’t have change). If your card isn’t accepted or the network appears to be down, don’t repeat the transaction attempt more than twice. Doing so may trigger security mechanisms. Wait a while or try a different ATM to avoid having your card captured by the machine. Remember: Your bank should be made aware of your travel plans so that a travel notification can be put on the account. Forgetting to tell them that you are traveling may prompt them to deactivate your card after "suspicious" charges pop up in Bali! Unlike in Burma, Cambodia, and Laos, U.S. dollars technically aren’t accepted in Indonesia other than when paying for the visa on arrival. That said, the U.S. dollar is still a powerful currency to have on hand when traveling — particularly for emergencies. You can count on being able to exchange dollars practically anywhere, and in some cases, you can use them outright. Some dive operations still quote prices in U.S. dollars — or euros — rather than Indonesian rupiah. Often when traveling through Southeast Asia, your credit card will really only be useful when paying for upscale hotels, booking flights in Indonesia, and possibly to pay for tours, scuba diving, and packaged activities. The few shops and restaurants that do accept credit cards for transactions will probably tack a fee onto the balance. Ask first before you try to pay with plastic — fees can be up to 10 percent! Mastercard is the most commonly accepted card, followed by Visa and then American Express. You’ll be able to exchange major currencies at the airport and in banks throughout Bali, however, pay attention to the exchange rate advertised. Using the ATMs is usually the best way to get the current international exchange rate, assuming that your bank doesn’t charge hefty fees for international transactions. Avoid random individuals in Bali who offer to exchange currencies. The same goes for unofficial kiosks and shops advertising that they will exchange money for you.